Turn RIGHT (West) onto SW Whitaker Street, then immediately turn RIGHT (North) onto SW Kelly Ave Towards US-26 E /Ross Is. Br. / Mt. Hood 0.1 mi. Keep STRAIGHT onto US-26/Powell Blvd 1.8 mi. Turn RIGHT on (South) onto SE 26 th Ave 0.8 mi. Turn RIGHT (West) onto SE Raymond Street 0.1 mi. At Exit 300B, turn RIGHT onto Ramp towards OR-99E / US-26 E / OMSI / Oregon City 0.4 mi. Keep LEFT to stay on Ramp towards Oregon City / OMSI 0.3 mi. Take Ramp (RIGHT) onto SR-99E (SE Martin Luther King Blvd) towards US-26 1.8 mi. Exit RIGHT onto SE Holgate Blvd. 0.6 mi. Turn RIGHT (South) onto SE 26 th Ave 0.2 mi. 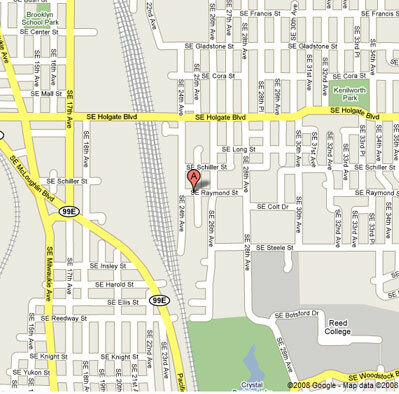 Arrive at Alaskan Copper & Brass Company 2440 SE Raymond Street.